Episode #199 of the NLSC Podcast is out now! Join Arcane, Kenny, and I as we get together to talk about some recent NBA Live 18 news, reflect on our past in week in basketball gaming, and react to a huge performance by Devin Booker. NBA Live 18 will be on display and playable at EA Play 2017. Are we optimistic, and what kind of details are we expecting to come out of the event? In Our Week in Basketball Gaming: a return to 2K Pro-Am and MyPARK in NBA 2K17 yields unexpectedly enjoyable results. Also, strange player movement in MyCAREER, MyTEAM challenges, and a new MyLEAGUE game. 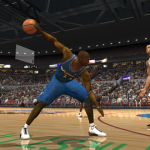 An itch to mod an old favourite has resulted in the release of an updated 1996 season roster for NBA Live 2004. The Phoenix Suns’ Devin Booker turned heads and set records when he scored 70 points against the Boston Celtics. We react to the performance, and some of the things that have been said about it. Episode #198 of the NLSC Podcast is out now! Join Kenny and I as we reflect on NBA 2K17 six months in, catch up on what we’ve been playing recently, and discuss a couple of topics related to the real NBA. NBA 2K17 has been out for around six months now. After many, many hours playing it, what are our favourite and least favourite aspects of the game? In Our Week in Basketball Gaming: 2K Pro-Am and MyPARK have lost their appeal for us. On the bright side, we’ve been having more fun with MyLEAGUE, MyTEAM, and MyCAREER. The practice of resting players in nationally televised games has prompted some harsh remarks from all-time greats. We offer up our thoughts on the matter, and some of the backlash. Larry Sanders has returned to the NBA. Will he be able to pick up where he left off a couple of years ago? Episode #197 of the NLSC Podcast is out now! Join Arcane and I as we discuss a couple of issues regarding the NBA 2K17 roster updates, our recent experience in online modes and what we might be looking to play instead, and a handful of NBA topics. Regular roster updates continue to come through for NBA 2K17. However, on top of a couple of other issues, it appears that the injury-free rosters aren’t actually injury-free. On a more positive note, starting a new MyCAREER will use the most recent official roster. Starting over at 55 Overall is still painful, though. In Our Week in Basketball Gaming: We’ve tried MyPARK and 2K Pro-Am, but online play is losing its appeal. MyCAREER, MyTEAM, and MyLEAGUE still hold intrigue however, and we get an idea for a fun challenge. Moving on to the real NBA, our fellow Aussie Andrew Bogut has suffered another unlucky break; literally. Will he end up in the NBL? Adam Silver has indicated that he’d like to make the All-Star Game competitive again. We’re encouraged to hear it! As the 2017 regular season enters its final stages, who are the frontrunners for the MVP? We wrap up Episode #197 of the NLSC Podcast with a milestone by Dirk Nowitzki. Episode #195 of the NLSC Podcast is out now! Join Arcane, Kenny, and I as we discuss the latest controversy with Locker Codes in NBA 2K17, recap a tough week in 2K Pro-Am, and look ahead to the 2017 NBA All-Star Weekend. NBA 2K17 celebrated Valentine’s Day with a Locker Code for a Kevin Love MyTEAM card, but the limited quantity didn’t exactly leave gamers swooning. We react to the controversy, and discuss what 2K could have done instead. In Our Week in Basketball Gaming: NLSC THRILLHO enjoyed an exciting overtime win in 2K Pro-Am, but also weathered some tough, tough losses. Also, a milestone performance in MyCAREER, and expanding collections in MyTEAM. A couple more significant trades have taken place, and it sounds as though a few more are in the works. We give our thoughts on the Toronto Raptors acquiring Serge Ibaka, and the Denver Nuggets trading away Jusuf Nurkic. With the 2017 NBA All-Star Weekend just about ready to get underway, we offer up our predictions for all of the events. We wrap up Episode #195 of the NLSC Podcast with a quick discussion of Ben Simmons. Will he make his debut this season, or shut it down until next year? Episode #194 of the NLSC Podcast is out now! Join Arcane and I as we discuss this week’s news and events, including the newly announced NBA 2K eSports league, problems in 2K Pro-Am, and an unfortunate incident involving Charles Oakley. 2K Sports is partnering with the NBA for an official eSports league. It’s a cool concept, but will it ultimately benefit a majority of the userbase? In Our Week in Basketball Gaming: We’ve had very little success getting matched up for games in 2K Pro-Am following Patch 1.10, though we did hit up MyPARK and a couple of Walk-On games. Also, Playoff success in MyCAREER, and the early stages of building a powerful MyTEAM squad. New York Knicks legend Charles Oakley was thrown out of Madison Square Garden in controversial fashion. Seems most observers are on Oak’s side, and we find it hard to disagree there. Episode #193 of the NLSC Podcast is out now! We’re back after taking last week off due to Australia Day, and we have some interesting topics to discuss, including the future of NBA Live, a new patch for NBA 2K17, All-Star Weekend 2017, and more. It appears as though The Drive to NBA Live has been cancelled, and EA Sports will instead be focusing on developing a fully featured NBA Live 18, coming in the Fall. We give our thoughts on the situation. A new patch has come through for NBA 2K17, addressing a few key problems gamers have been having. Aside from that, have we noticed any remarkable differences? In Our Week in Basketball Gaming: an update on our MyCAREER games, including some All-Star Weekend disappointment, and the latest highs and lows of NLSC THRILLHO in 2K Pro-Am. The 2017 All-Stars have been announced. Unfortunately for Zaza Pachulia, the league stepped in and squashed his All-Star hopes. Dysfunction and drama are the common themes in the NBA right now, from the Chicago Bulls’ struggles to a war of words between LeBron James and Charles Barkley. Episode #190 of the NLSC Podcast is out now! It’s our 2016 Year in Review episode, as we’ll be taking a short break before resuming our digital broadcasting duties in early January. Thank you to everyone who has tuned into the NLSC Podcast throughout the year; we greatly appreciate the support! We tip things off by talking about our Basketball Game of the Year. Or, in other words, which game we’ve enjoyed the most out of the three that we’ve been playing regularly at some point over the past twelve months. There’s been some interesting and surprising news and events in 2016, both in basketball gaming and the real NBA. We recap some of the major stories, including NBA Live 17’s delay, the mixture of controversy and exciting details during the NBA 2K17 preview season, the Cleveland Cavaliers’ championship, the retirement of several big names, and more. Back in June, we had a stressful time here at the NLSC when it looked like we might have to scale back or even shut down operations after our former host informed us that they were closing up shop. Fortunately, we found a new home and expect to be around for a while yet. Thank you to everyone who has donated to the hosting fund, or continues to support the site in other ways! As 2016 draws to a close, we look ahead to 2017. What do we want to achieve next year? What are some of the things that we have planned? We have a few ideas, and hope that you’ll stick around for the ride! Episode #189 of the NLSC Podcast is out now! News is slowing down with the holiday season upon us, but Arcane and I still have a few things to talk about this week, including another exciting win in 2K Pro-Am, further thoughts on Patch 1.07 for NBA 2K17, and the passing of a broadcasting legend. Patch 1.07 is out now for the PC and Xbox One versions of NBA 2K17. Once again, we can’t help but remark on the difference in size between the three patches, despite them all containing the same content and fixes. The next eSports tournament for NBA 2K17 has officially been announced, with another $250,000 up for grabs. We’re not able to take part, but that might actually be for the best. In Our Week in Basketball Gaming: a clutch victory with unexpected heroics in 2K Pro-Am, and dusting off a couple of classics. The NBA and Players Union have come to terms on a new agreement, thankfully avoiding a lockout at the end of the season (or so it would seem). We wrap up Episode #189 of the NLSC Podcast with a discussion of the late Craig Sager, and some of the beautiful tributes from players, coaches, and broadcasters in the wake of his passing. Episode #186 of the NLSC Podcast is out now! Join Arcane and I as we discuss Patch 1.06 for NBA 2K17, the upcoming Park After Dark event in MyPARK, a tidbit of NBA Live 17 news, and more. 2K is presenting the “Park After Dark” event in MyPARK this weekend, with Snoop Dogg making an in-game appearance as DJ Snoopadelic. It’s not really our thing, but it does sound kind of fun for MyPARK players. NBA 2KVR has been announced. Might some of the technology be adapted for use in the main game in future years? NBA 2K17 has received Patch 1.06. Although some issues have been resolved, unfortunately it seems that some new bugs have also arisen, and not everyone is happy with the tweaked gameplay. We’re starting to hear promising bits and pieces about NBA Live 17 from developers on social media. Senior Producer Mike Mahar also had a few things to say about the game in a recent chat to FOX 13 News in Tampa Bay. In Our Week in Basketball Gaming: An enjoyably successful run in 2K Pro-Am, two more quadruple-doubles in MyCAREER, and a surprising lack of loyalty. We wrap up Episode #186 of the NLSC Podcast with some NBA chatter, including the Detroit Pistons’ impending move to a new arena, Zach LaVine’s incredible 360 dunk from the foul line, and Kevin Love’s big first quarter against the Blazers. Episode #185 of the NLSC Podcast is out now! Join Arcane, Kenny, and myself as we discuss recent modding releases, issues with YouTubers getting banned in NBA 2K17, and a few other topics of interest from the past week. We tip off Episode #185 of the NLSC Podcast with a round-up of the latest releases from our talented NBA 2K17 modding community. Some excellent retro mods have been created so far! It seems that Patch 1.06 for NBA 2K17 is in the pipeline. What do we expect it to fix? What do we want it to fix? Dime Magazine recently posted a countdown of the ten funniest glitches in NBA 2K. Which ones have we experienced ourselves? There’s been a lot of dissatisfaction with 2K Sports recently, as several YouTubers have been banned for unclear Terms of Service violations. We discuss 2K’s handling of the situation. What are some of our favourite jerseys that aren’t available in NBA 2K17? In Our Week in Basketball Gaming: a reminder that career modes have come a long way since NBA 2K10, and the most recent 2K Pro-Am games for the NLSC THRILLHO squad. We wrap things up with a couple of NBA topics, namely Tim Duncan’s impending jersey retirement, and a record for Aussie NBA players. Episode #184 of the NLSC Podcast is out now! Join Arcane and I as we discuss Patch 1.05 for NBA 2K17, offer up some more thoughts on what might be happening with NBA Live 17, and talk about a couple of other topics from the past week. We’ve started the ball rolling on our NBA 2K18 Wishlist, and encourage everyone to get involved in posting some constructive feedback for the development team. Off the top of our heads, what are some of the main issues we’d like to see addressed in NBA 2K18? Patch 1.05 has been released for NBA 2K17, addressing several bugs and tuning a few elements of the game. Some fixes are working better than others, but at least the timeout glitch is gone from 2K Pro-Am. New rosters are also coming through for NBA 2K17 again, and a recent update has added Steve Nash back to the 2003 Mavericks and 2005 Suns. What do we make of the radio silence from EA Sports regarding NBA Live 17? What do we think is going to happen with the game, and what are our expectations? In Our Week in Basketball Gaming: tough times and bratty kids in 2K Pro-Am, and a milestone achievement in MyCAREER. We wrap up Episode #184 of the NLSC Podcast with some NBA talk, including Stephen Curry’s record-breaking thirteen three-pointers in a game, and Dwyane Wade’s first game against the Heat. Episode #183 of the NLSC Podcast is out now! Join Arcane, Kenny, and myself as we talk about the upcoming NBA 2K17 patch, some huge performances in 2K Pro-Am, and a couple of NBA stories from the past week. We tip off Episode #183 of the NLSC Podcast with some community announcements, including additions to the Contributors group in the Forum, and new content in the Wiki. NBA 2K17 hasn’t received a roster update since mid-October, owing to a problem caused by the most recent patch. An upcoming title update is expected to fix that issue, as well as problems with disconnections in 2K Pro-Am, but what about the timeout glitch? In Our Week in Basketball Gaming: the best three game stretch of 2K Pro-Am that any of us are likely to have, a quick session of LIVE Pro-Am, and the latest results from our respective MyCAREER games. We wrap things up with some NBA talk, including Ray Allen’s retirement, hot starts for Anthony Davis and Russell Westbrook, and the highly anticipated Golden State Warriors vs. Oklahoma City Thunder game. The 2017 NBA season has just tipped off, with a couple of big names making their first appearances for new teams, and a few rookies making their league debut. While the start of a new season is a time to look forward to what will hopefully be another great year of basketball, it’s not uncommon to take the opportunity to look back on the debuts of all-time greats. If you look up “On This Date” lists for October and November, you’ll usually see the debuts of some of the biggest names in basketball history among the dates that are noted. On this particular date – October 26th – Hall of Famers and 1992 Dream Team members Michael Jordan, Charles Barkley, John Stockton, and Patrick Ewing all made their NBA debut; Jordan, Barkley, and Stockton in 1984, and Ewing in 1985. For this week’s Wayback Wednesday, I thought I’d share some screenshots of those players’ first appearances in basketball video games, as well as their last appearances as active NBA players. Of course, all four players appear in NBA 2K17, as members of the aforementioned Dream Team. Episode #181 of the NLSC Podcast is out now! Join Arcane and I as we discuss the latest NBA 2K17 news, provide a round-up of some recent retro modding releases, and reflect on some more success in 2K Pro-Am. A European eSports tournament for NBA 2K17 is tipping off next weekend. We’re not eligible ourselves, and we’re also more casual in our approach to online gaming besides, but it’s cool to see nevertheless. The Nintendo Switch (codenamed Nintendo NX) has been revealed, and it seems it will have much stronger third party support, including a port of NBA 2K17. Will we be picking it up? As our NBA 2K17 modding community continues to do some great work, we also want to recognise the efforts several users have been making in keeping older games up to date. We quickly round up some of the recent releases for older NBA Live and NBA 2K titles. In Our Week in Basketball Gaming: a couple of really fun sessions of 2K Pro-Am with more clutch wins, and a lengthy winning streak in MyCAREER. Some interesting rumours are making the rounds about LaMarcus Aldridge possibly being traded by the San Antonio Spurs. Elton Brand has reportedly changed his mind about playing one more season, and will be calling it a career. One of us wishes he could’ve spent more time in Chicago. We wrap up Episode #181 of the NLSC Podcast with some quick thoughts on the epic finale of the 2016 WNBA Finals between the Los Angeles Sparks and Minnesota Lynx.